Not a Welsh Rarebit in Sight. No Sir! Why?! 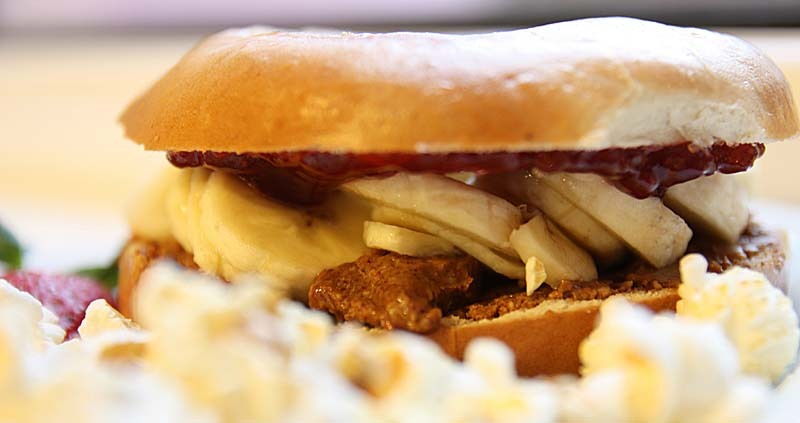 Because we have something even better - the Glamorgan Dog; or if you want to be a bit downright dirty, then call it The Vegi Glamorgan Daug. 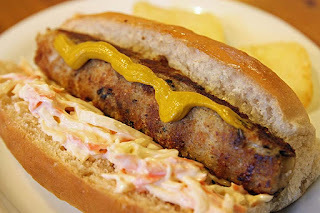 In anticipation of St Davids tomorrow, I have been offering Glamorgan Sausage Dogs (based on the American Hot Dog) all week. 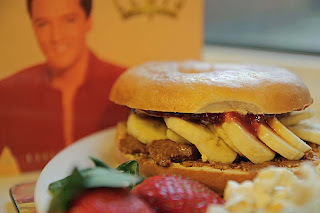 I have to admit, they are not yet as popular as the vegetarian burgers I make or the eyebrow raising and conversation starting Elvis Presley Bagel - but they do certainly get the thumbs up for flavour. I could easily have served up Welsh Rarebit like many eateries here in Wales, but to me Welsh Rarebit is effectively just cheese on toast jazzed up a little with some designer leaves on the side. 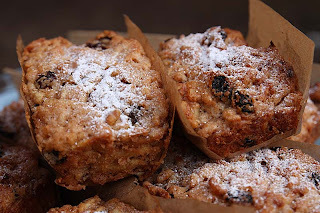 I guess its the celebrity chef Gary Rhodes affect, some of you may remember when he made the humble and homely Bread and Pudding fashionable to eat at high end restaurants. So some places can get away charging almost £7 for cheese on toast, but not here - here we are going a little bit modern and its only under £3. 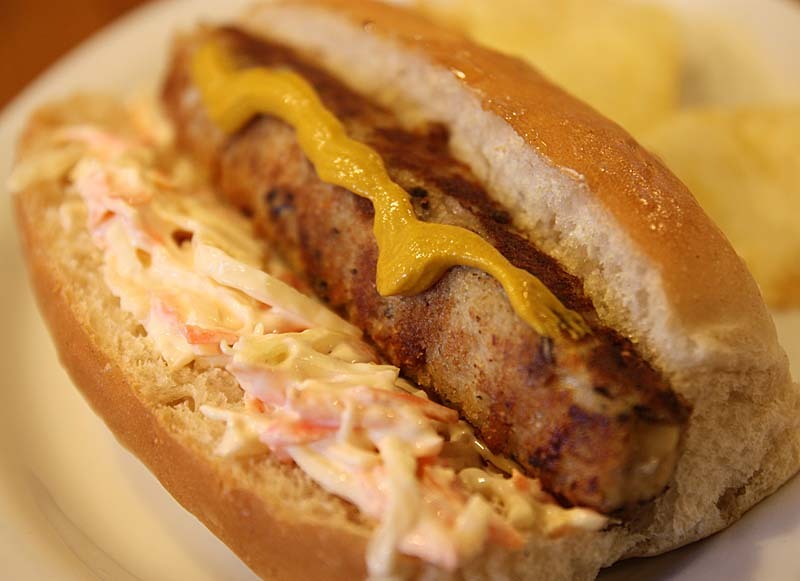 The Glamorgan Sausage known as Selsig Morgannwg in W elsh is made from Caerphilly cheese, leeks, breadcrumbs, mustard, seasoning and binded with egg yolk is freshly made and cooked and then put into a finger roll, that is generously filled with home-made coleslaw and a good squirt of French Mustard, on the side for garnish if you so wish - some salted crisps. For my Glamorgan Sausage recipe follow this link. Alongside the vegetarian Glamorgan Dog, I have also been making a Vegetarian Chilli Dog, a fat vegetarian sausage doused generously with home-made chilli (or to keep it strictly Welsh topped with my take on what would be a Welsh Chilli Con Carne) and then prettily tarted up with some jalapeno peppers. The soured cream and extra Welsh cheddar cheese is optional, but more about that later. I will also share you more original Welsh inspired delights over the next few days including the Welsh Chilli Con Carne, just got to remember to take my camera with me. 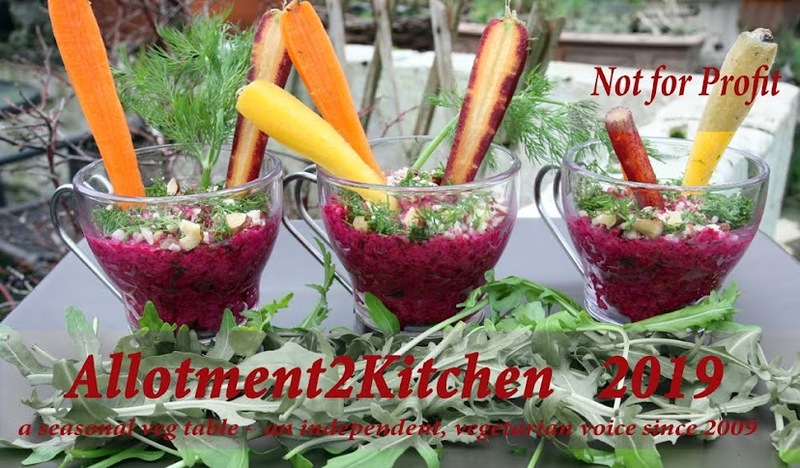 And if you can't wait, here are some Vegan and Vegetarian Welsh dishes from previous years featured on my blog. Or click on this link and I mustn't forget my Welsh Eggs! I am off to the theatre later this evening to watch Facade: that promises to be an intimate and theatrical three course meal, during which, drama unfolds. I believe the theatrical part, but not sure about the intimate part - especially as there will be a fair size audience. Nevertheless, I am genuinely looking forward to it and hope to share more about it later on in the week. I am also looking foward to putting on my glad rags and some rouge for the cheeks and lips. Its been a while, since I've spruced up andmoreso eaten out. 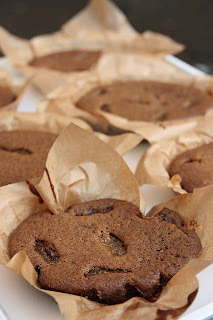 Anyway, onto some cakey delights - today I share with you some vegan chocolate gingerbread cakes. 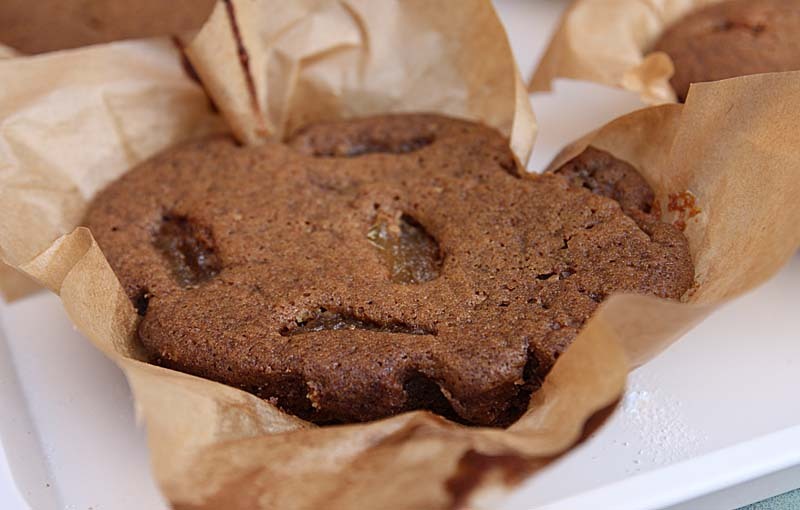 Part of me wished I had one of those silicone gingerbread people moulds (a bit like the heart shaped moulds I used for my Valentines strawberry jelly) and then this would have been so darn cute to serve. Maybe next time, unless of course you beat me to them. 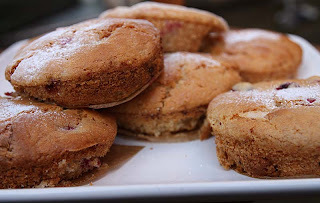 Regardless of how they look, one person who had the cake said it was so delicious, he couldn't help scraping the last of the cake remnants from the baking parchment paper. I am sharing this with Choclette and Chele for their monthly We Should Cocoa Challenge. 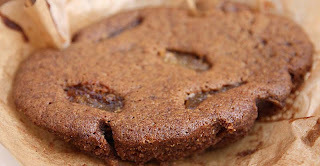 The theme for February is ginger and it is hosted by Jen of Blue Kitchen Bakes. Heat the oven to Gas Mark 5. 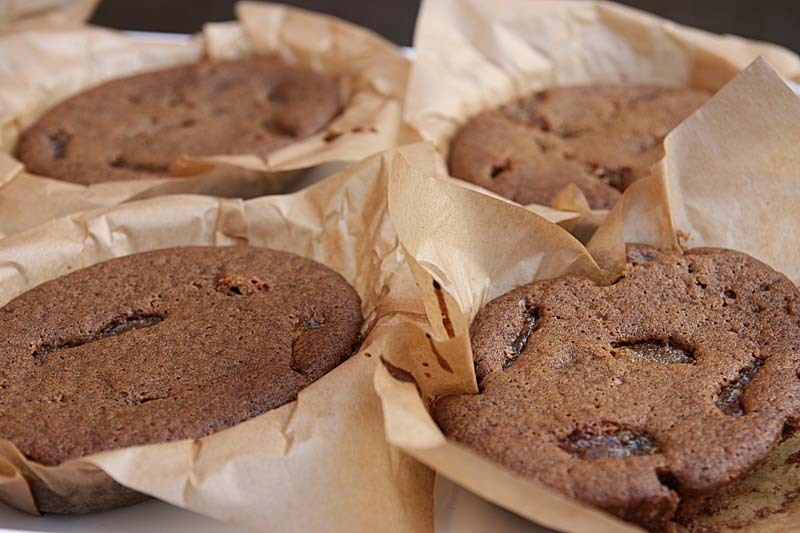 Oil an 8 inch round baking tin or 6 - 8 round/oval cake tins lined with parchment paper. 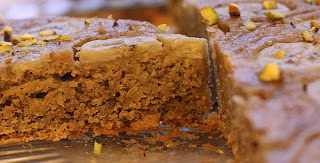 Pour the batter into the prepared pan and bake for 30 – 35 minutes, or until a toothpick in the centre of the cake comes out clean. These are better served the following day. Unlike other bagels that are toasted, this one is baked in the oven for a few minutes. 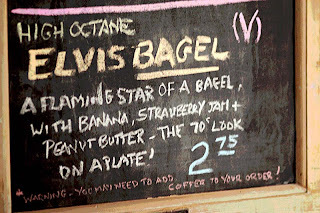 I think it makes the bagel more doughy and chewy which I like. 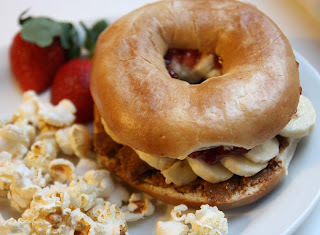 Then the bottom half of the bagel is spread generously with smooth peanut butter, the top half generously with good strawberry jam. Before both can kiss, the middle is packed in a domino fashion with sliced banana for height and visual impact. Then put together on an oval plate and served with salted popcorn, sometimes some pretzels and when in season - fresh strawberries. Its truly rich and filling. 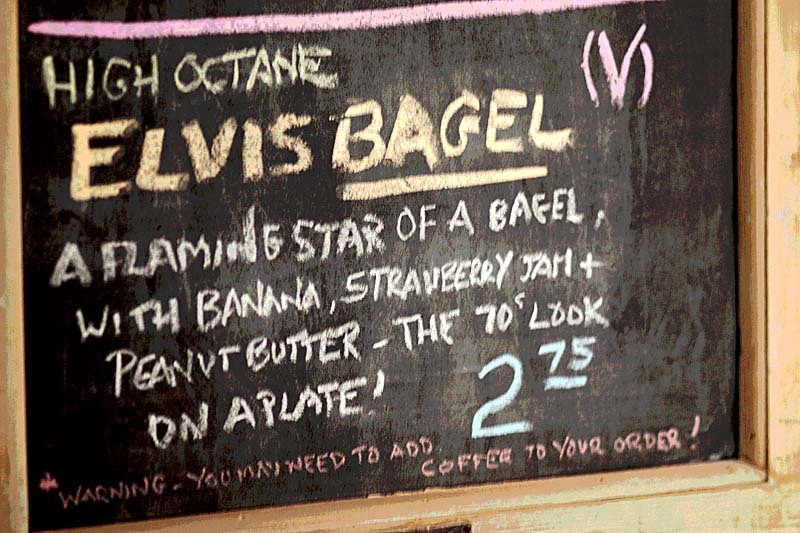 This is one high octane of a Bagel. Yes it can only be the Elvis Presley Bagel - A flaming star of a bagel with sliced bananas, strawberry jam and peanut butter - the 1970s look on a plate. WARNING: You may need to add coffee to your order!!! 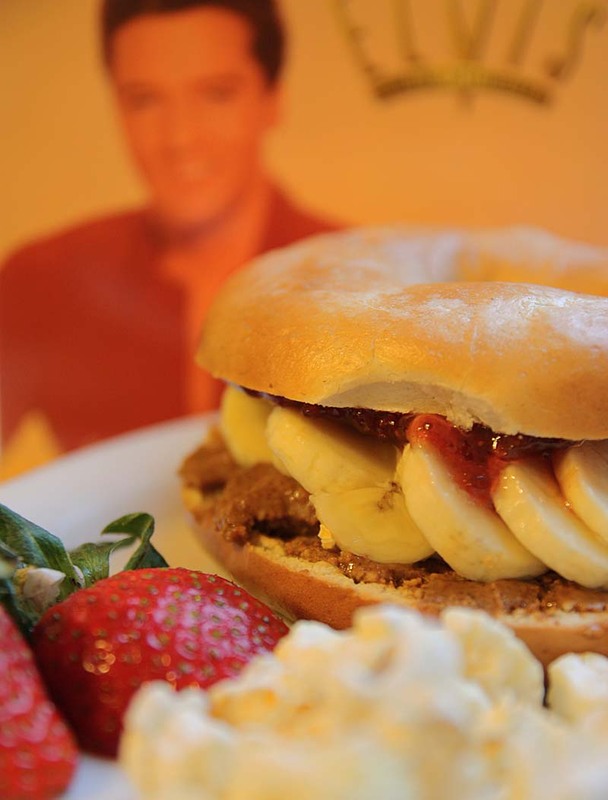 Now get your gnashers into that bagel! 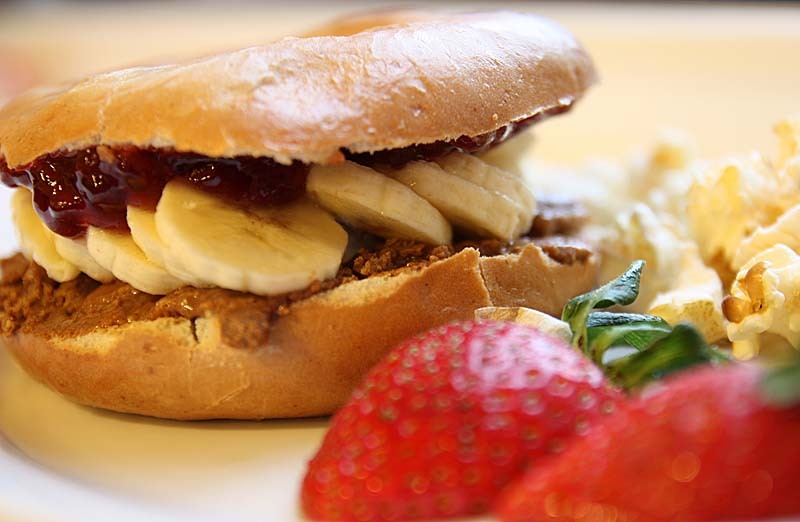 Do you have a favourite bagel filling, I'd really like to know? 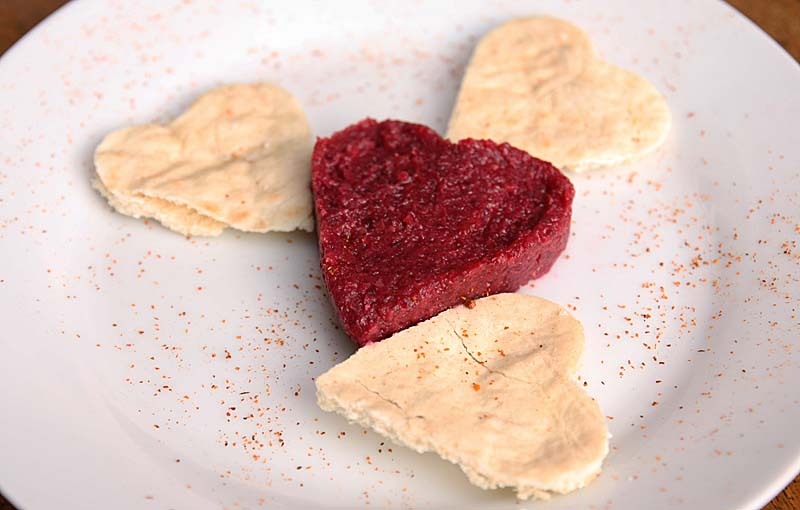 I know Valentines was last week and I also missed Wales own Valentines Day - Dydd Santes Drynwens Day - Welsh Saint of Love celebrated on the 25th January only because I got distracted with a Vegetarian Burns Night in Wales. But this time, I thought no I am going to participate in what has become a commercial and mainstream annual event, but only in a culinary fashion and adorn my table with some heart shaped dishes, not just good to the eyes, but for the appetite too. 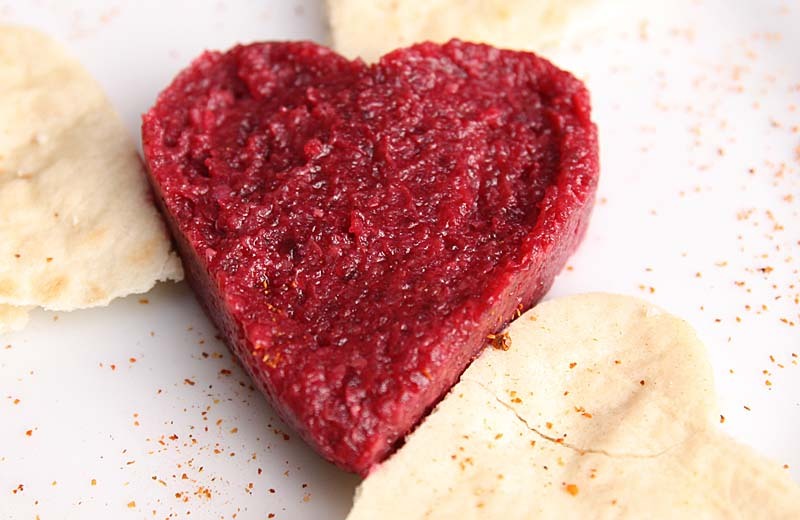 Presentation does matter, and beetroot doesn't always appeal to everyone, so I used my heart shaped cookie cutter for both the beetroot heart filling and for the cut out pitta chips hearts. They went down a treat and pleased all those who set eyes on them. I am sharing the Beetroot Hummus recipe with Ricki at Diet, Dessert, Dogs for her Wellness Weekend: 14-18th February 2013 and to Caroline at Crumbs and Cooking who is hosting Februarys edition of Simple and In Season an event started by Ren Behan at at Fabulicious Food. 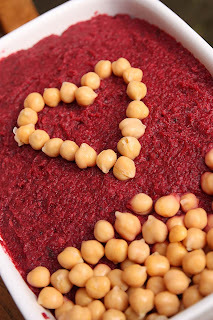 Whizz all the ingredients a food processor until pureed. Serve immediately or chill for later, that is of course if you can wait! Slice into strips; or use a heart shaped cookie cutter to cut out heart shapes. Coat lightly with olive oil and a little salt and bake in a moderately high oven for 10 - 15 minutes or until crisp. Allow to cool, before serving. Store in an airtight Tupperware for later use. I've not had jelly for a long while, I gave it up many many years ago when I learned it was made from bovine or pork gelatin. 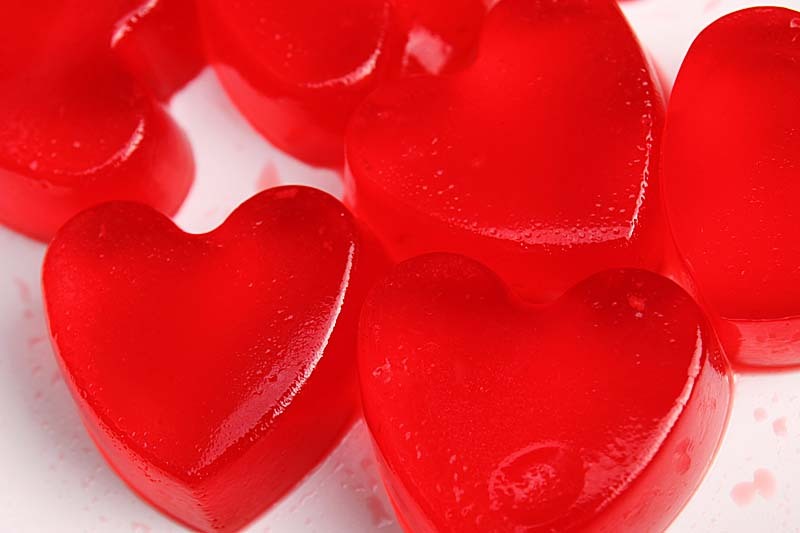 Its only in the last year, I have begun to dive into a trifle or a bowl of jelly when I found out it was made from agar agar or carrageenan - a seaweed extract - suitable for both vegetarians and vegans. This is not to say, I will be indulging in wobbly brightly coloured edible delights loads, no they will only be made for celebratory occasions. 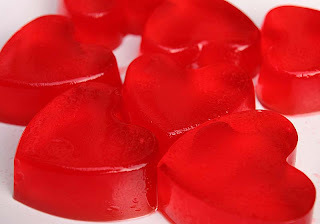 Of course, I had to make some heart shaped jellies (using my silicone heart shaped moulds) for my Valentines evening. Its the first time I had used them for making jelly and they were fantastic and plopped out of the moulds so easily. 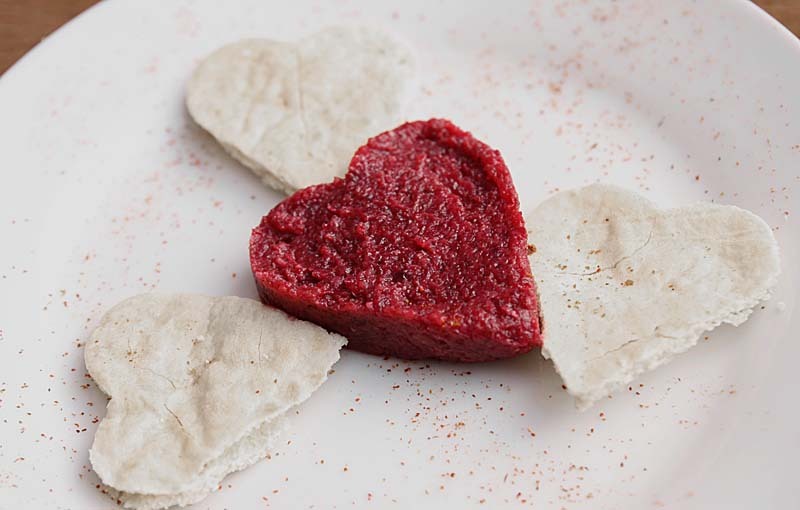 These little edible strawberry flavoured hearts were adored with fresh berries and cream. Many of you will know that I don't partake in St Valentines Day, but my work commitments require it somewhat; and also, I do not want to exclude my readers who enjoy the romantic gestures. So Happy Valentines to you and your loved ones. For those of you interested, follow this link to see the menu I devised for Valentines Days. Recipe for this Beetroot Hummus can be found here. 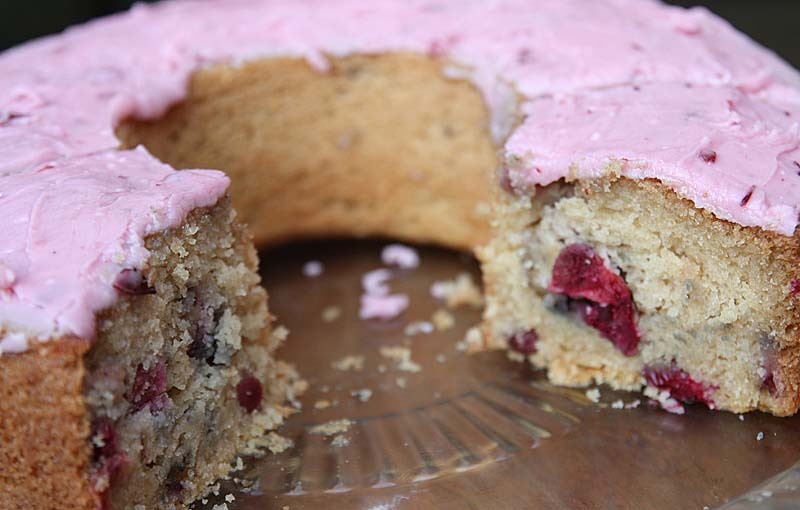 I have quite a lot of cranberries in the freezer left over from Christmas holidays, that have to be used one way or other; and cake is the way forward. In the past I have been pretty good at preserving, but the last year or so, a lot of what I cannot use has ended up in the freezer, rather than go to the compost bin. 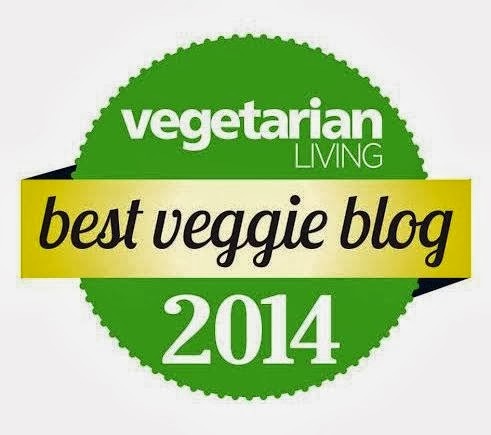 Do you have a lot of frozen vegetables or berries in your freezer? I'd like to know. 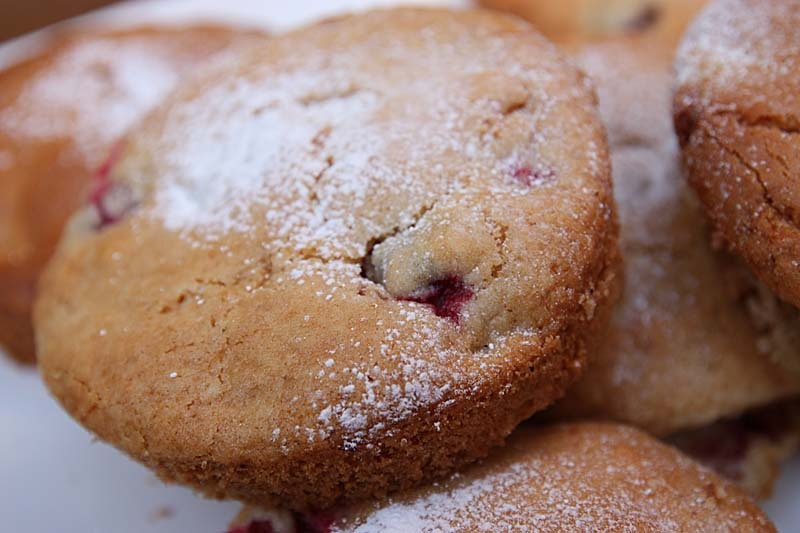 Well here are a fresh batch of these soft sponge centred cake, every now and again you will bite into a bit of white chocolate laced with bursted sweet-sharp cranberries. 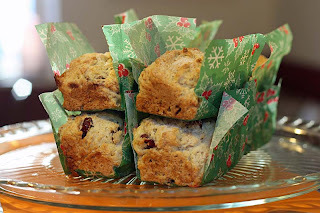 I had originally made these White Chocolate and Cranberry Cakes in the shape of mini loaves for Christmas (see below), hence the Christmas parchment paper. Recipe will appear here soon. Its been a really busy week, that my head is still spinning from both tiredness and excitement; and I am a little sad to say, the weekend is almost over too. Tiredness, because its been a long week at work in terms of hours;and excitement - I attended my first Cake Club today (more about that later in the week), but what I am willing to share right now is the cake I made for my first meeting: A Cranberry Cake that happens to be suitable for those on a vegan diet. A full head shot of this pink cake would appear on first glance like a rather large pink doughnut that even Homer Simpson would have difficulty chomping on, but it is not a doughnut but cake made in a Bundt tin, which I have been perusing a lot lately. 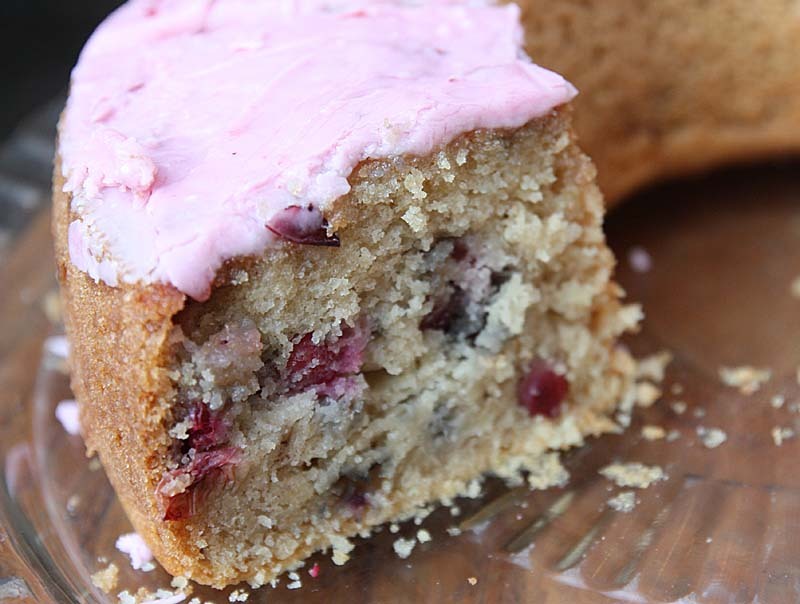 This is one of the most moist cakes I have ever tasted and created. 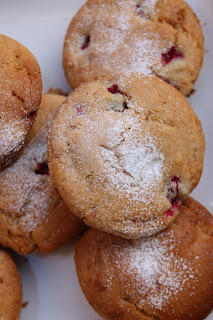 I loved how the fresh cranberries burst in the batter, not just turning it mulberry in colour but purple in places too. 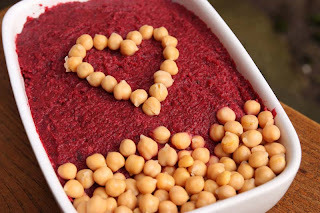 I am sharing this recipe with Hey what's for dinner mom?! Just Another Meatless Monday. Recipe to be posted here soon. 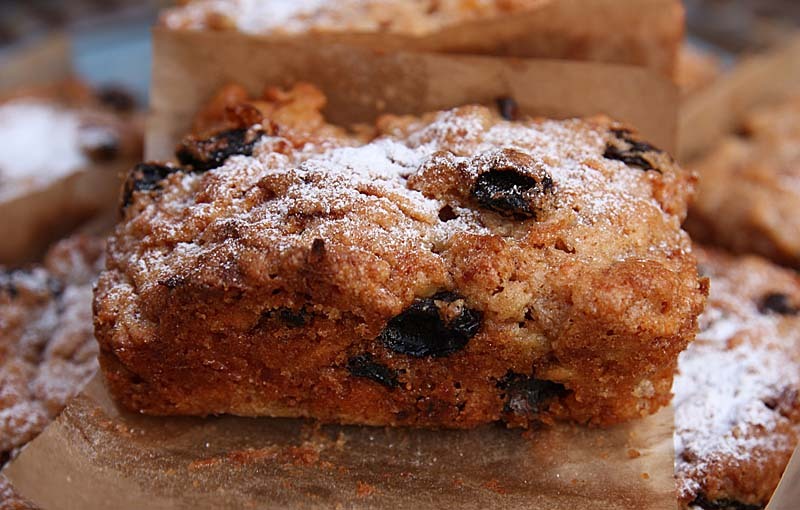 This is one of those cakes that people take a peek at and snug or wrinkle their noises, and then upon tasting are immediately converted declaring their sudden liking for parsnips, or parsnip cake at least. 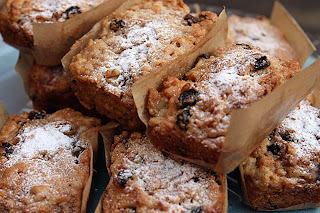 I too think I like this particular parsnip cake more than carrot cake now, even my mother has given it a thumbs up and she's not that keen on parsnips either. 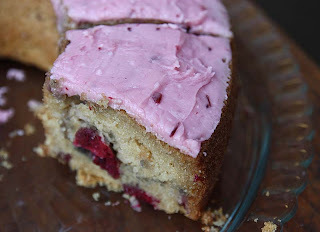 Last month I shared a Retro Parsnip and Violet Cake with Ren at Fabulicious Food. This month its another parsnip cake recipe, but this one is suitable for vegans all over the world. This February Simple and In Season it is being hosted by Caroline at Cake, Crumbs and Cooking. Preheat oven to 350 degrees and grease a 9x9 inch square pan with oil or 8 - 10 mini loaf tins. 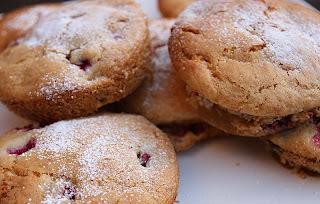 Mix together the flour, sugars, salt, baking powder, baking soda and cinnamon until thoroughly combined. Add the shredded parsnip and the oil to the dry ingredients and mix well with a spoon. Add the apple juice and mix again, then fold in the raisins and nut. Put the batter into pan(s). Bake for 45 minutes for larger version or 30 minutes for smaller versions; or until a toothpick comes out clean when inserted in the centre. Although the sun was out most of the day, it was quite deceiving. Not at all warm , In fact, I feel ice in the air, there was a flurry of snow earlier but that was it - thank goodness. A little off the subject of food for a moment. I haven't had my hair cut now for a year and it was long, down below my waistline, I haven't had it that long for a while. It looked gorgeous, but with the work I am doing presently it has to be tied back, this means that I do not get to show of my curly locks and sway my hair to and fro. Also as much as I am loving the long wavy hair, its a nuisance first thing in the morning, washing it. Its getting all tangled in knots now, and I do not have the inclination in the morning to hair dry it, as well as the fact I do not own a hairdryer. There was once a time I'd be happy to let it dry and curl naturally, but with the weather being so miserable, grey and wet - I just don't want to be sitting around with damp hair. So at the weekend, I went and got it cut, quite drastically for me. Its almost a bob and I don't like it, so I am pulling a sad face now and again. Its not the hairdressers fault, I told her to lop it all off. Its only when I got home to wash it and tie it back, that I realised I didn't have much hair to tie back. I know it will grow back, but I am missing it already - my long hair was also like my ear muffs and scarf keeping my ears and neck warm. Oh well, I just got to get used to it. 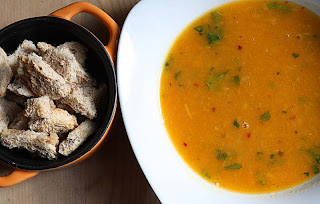 I am sharing a bowl of this soup with Jill at Fat Tuesdays; Tasty Tuesday Parade of Food hosted by Beauty and Bedlam; and The Hearth and Soul blog hop hosted by April of 21st Century Housewife, and Deb of Kahakai Kitchen for this week’s Souper (Soup, Salad and Sammies) Sundays. Heat the oil in a pan, fry the onions until soft. Add the squash and fry until it begins to soften a little, then add in the chilli flakes and cook for a few minutes. Then pour in the stock and bring to the boil. 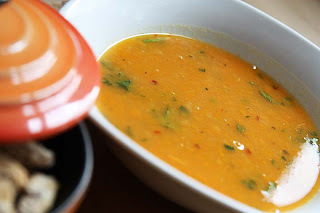 Reduce the heat and allow to simmer until the squash is tender. 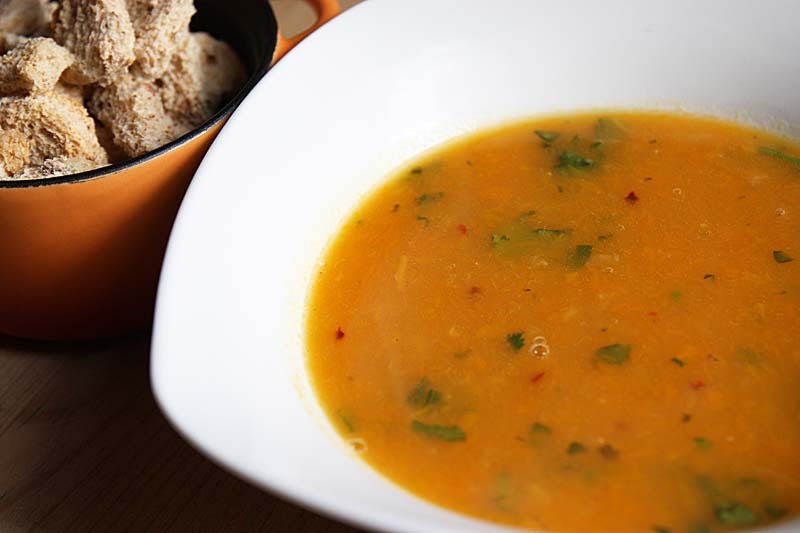 Stir in the minced coriander and add salt to taste, simmer until the coriander begins to wilt. 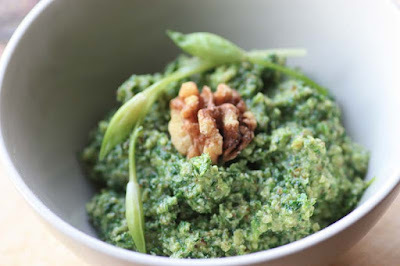 Turn off heat, allow to cool before transferring to a blender and blitzing to a puree. Tweak seasoning and serve. I can't believe its already Monday. I feel so tired, so please forgive me for this rather short post. I am off to brush my teeth and get myself into bed. 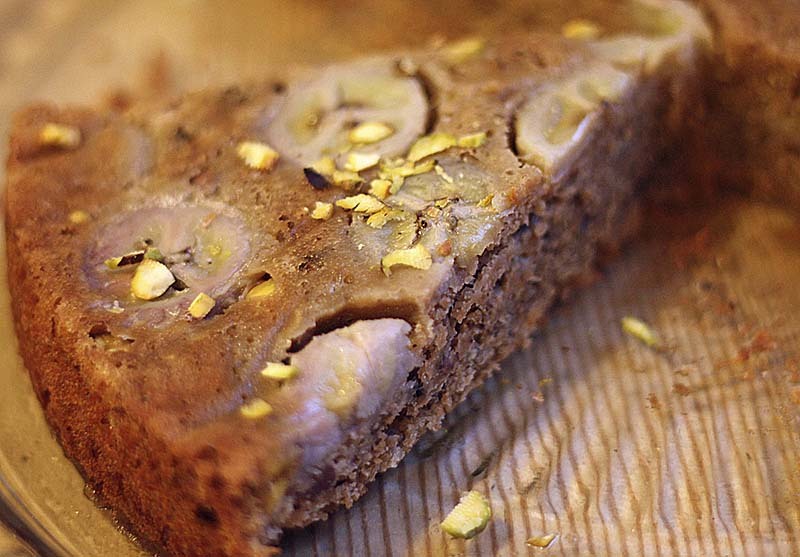 I leave you with this Banana, Darjeeling and Pistachio cake. 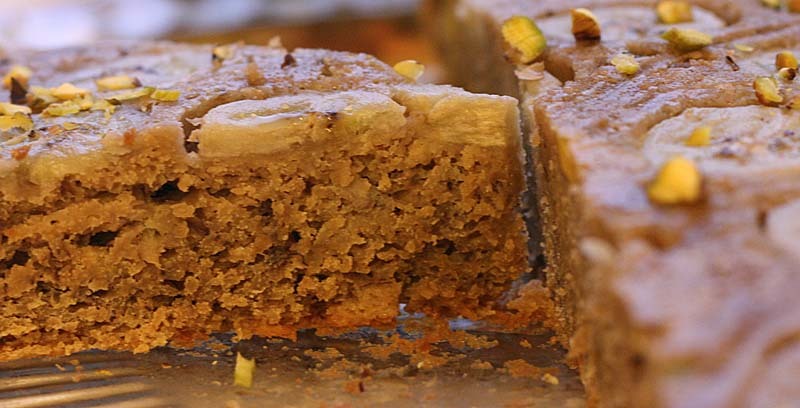 I've made this Banana and Darjeeling cake before, but this is a variation with the inclusion of pistachio nuts - only because I had them to hand. Its a moist cake. 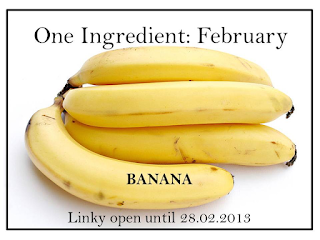 I am sharing a slice of this cake with Laura of How to Cook Good Food and Nazima of Franglais Kitchen who are featuring bananas for Februarys edition of One Ingredient. Add the tea bags to the boiling water in a measuring jug, making sure they are all submerged. Allow to stew until cold. Then squeeze the tea bags to get as much liquid from them as possible. Discard the tea bags and measure out ¼ pint of tea, saving the rest. Mash the banana with the butter and brown sugar, then stir the measured tea, the eggs, flour and baking powder and beat until the mixture is light and fluffy. Stir in the pistachio nuts. Line an 8 inch cake tin with non stick baking paper, spoon the mixture in and gently level the surface. Bake in a preheated oven gas mark 4 for 40 –45 minutes, or until a skewer in the centre comes out clean. Cool for a minute or so in the tin, then turn out on to a wire rack and leave until cold. I didn't get round to taking a photograph of it, but I made my first ever Clootie Dumpling last year for St Andrews Day and wow, it turned out pretty good; not pretty to look at, but pretty good to eat. 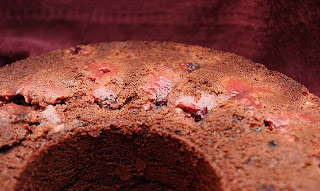 I had wanted to make Clootie Dumpling again for my Burns Night Menu, along with other sweet Scottish delights such as Crannachan and Typsy Laird Trifle , but time got the better of me and I ended up making a Vegan Chocolate and Raspberry Bundt Cake; and the Irn Bru Jelly as mentioned in a previous blog post. A bundt cake is a cake baked in a cake tin with as hole in the middle. The cake tin also has a ridged edging. 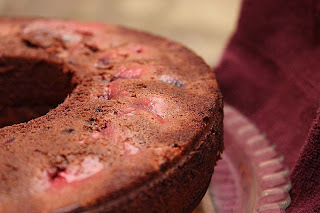 My bundt tin has ridge edging but it didn't come out distinct as it should have, I think it was because the raspberries were moist and seeped through a little, but I think you get the idea from the photograph. So what is so Scottish about this cake?! The raspberries of course - they are from Scotland, albeit frozen from the freezer. I would have loved to have adorned the cake furthermore with fresh raspberries, but they are not in season here, so frozen raspberries it had to be this time. This was a good cake. The squished soft raspberries burst inside whilst cooking flavouring this chocolate cake that would have otherwise have been a little dry on the palette. Very nice indeed and its sliced generously too. I've also made this cake with Summer berries. Recipe to follow at the weekend. If you don't have a bundt pan, use a large deep round pan. It will be fine.